Who's talking about town halls in Congress? With the passage of a 1.3 trillion dollar omnibus spending bill, Congress is headed home to their districts for a two-week recess. There will be plenty to discuss with constituents as primary season is in full swing, but how vocal have members of Congress been about hosting town halls? Here's a look at the legislators leading the dialogue on town halls in 2018 and how it compares by party. Democrats are mentioning town halls more frequently than Republicans. 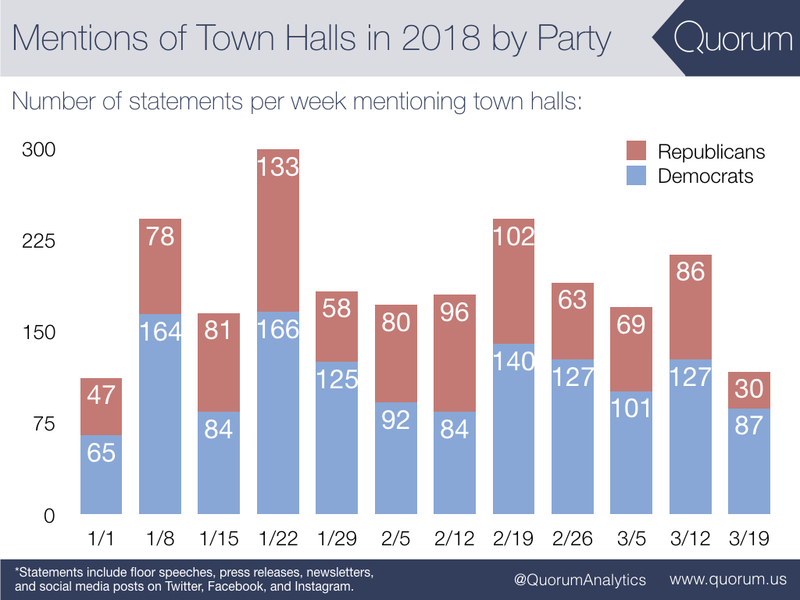 In the first 12 weeks of 2018, Democrats have mentioned town halls in more statements than Republicans, 11 of the 12 weeks. This past week, as we neared recess, there was a notable drop-off in the number of statements from members mentioning town halls. 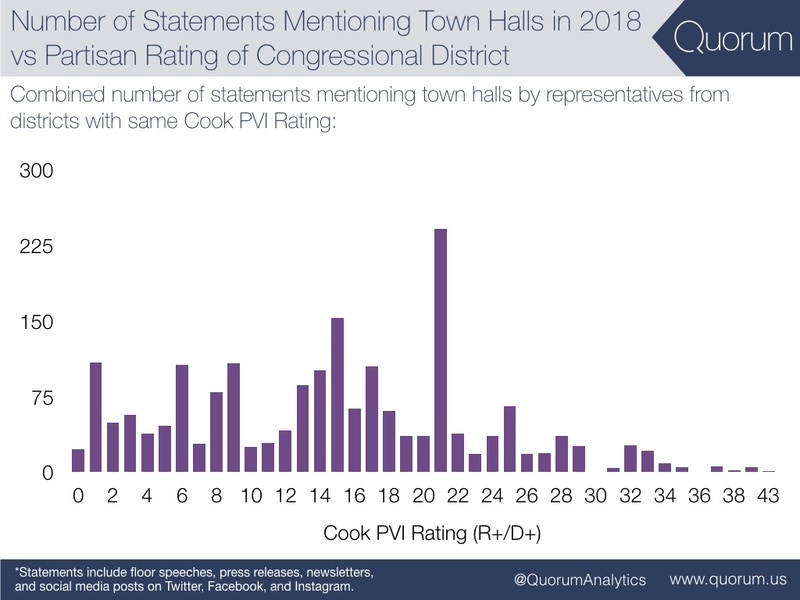 Members from D+21 districts have been the most vocal on town halls in 2018. A unique cluster of members from D+21 districts including Reps. DeSaulnier (D-CA-11), Thompson (D-CA-5), Beyer (D-VA-8), DeGette (D-CO-1), Smith (D-WA-9), and Matsui (D-CA-6) have mentioned town halls in a combined 241 statements this year. The higher a legislator's PVI rating (more "safe" districts), the fewer statements they are making about town halls. 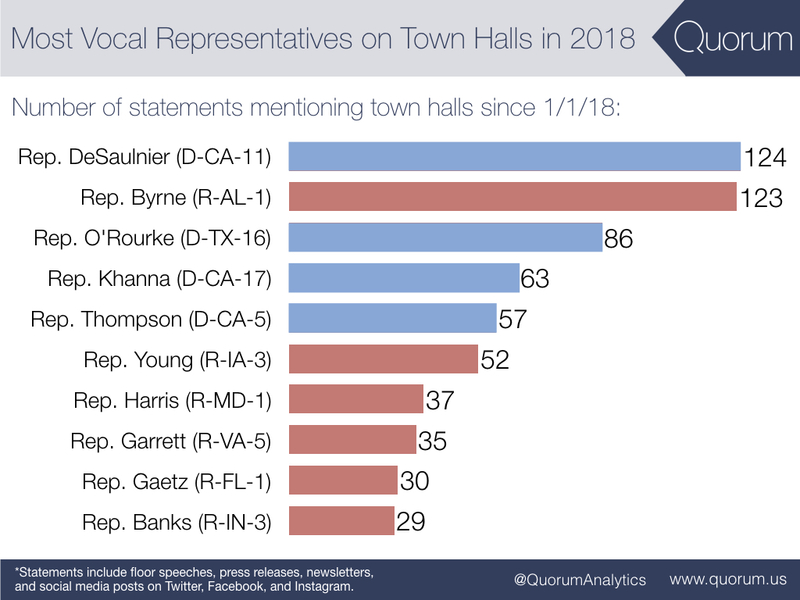 Rep. DeSaulnier (D-CA-11) and Rep. Byrne (R-AL-1) lead their parties in the House as the most vocal on town halls. So far in 2018, representatives in the House have mentioned town halls in a combined 1,977 statements. Six Republicans and four Democrats make up the top ten most vocal members. The average Cook PVI Rating of these members' districts is R/D +16.